Need a new deck, porch, or fence? 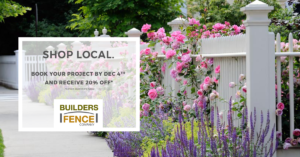 Book your home improvement project with Builders Fence Company before December 4th to receive 20% off your entire project! Start planning your new and improved backyard now, and save BIG. Remember: offer expires December 4th.